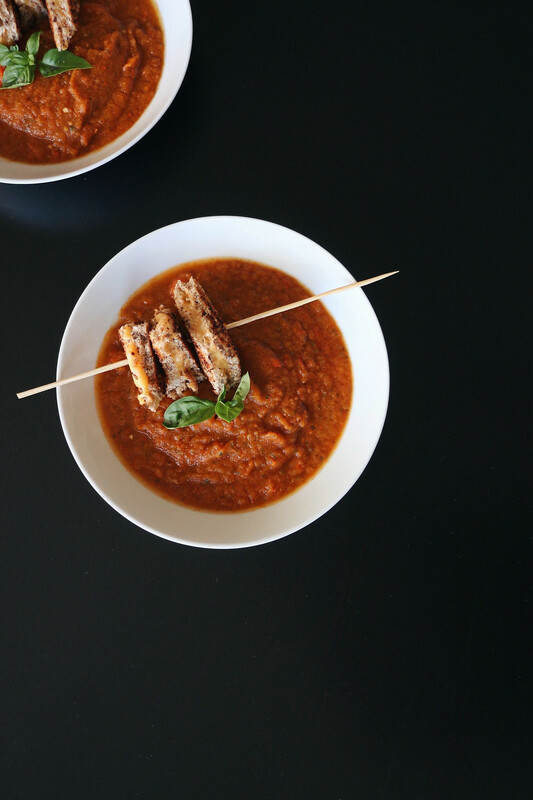 Slightly sweet tomato soup & a salty grilled cheese sandwich go hand in hand. 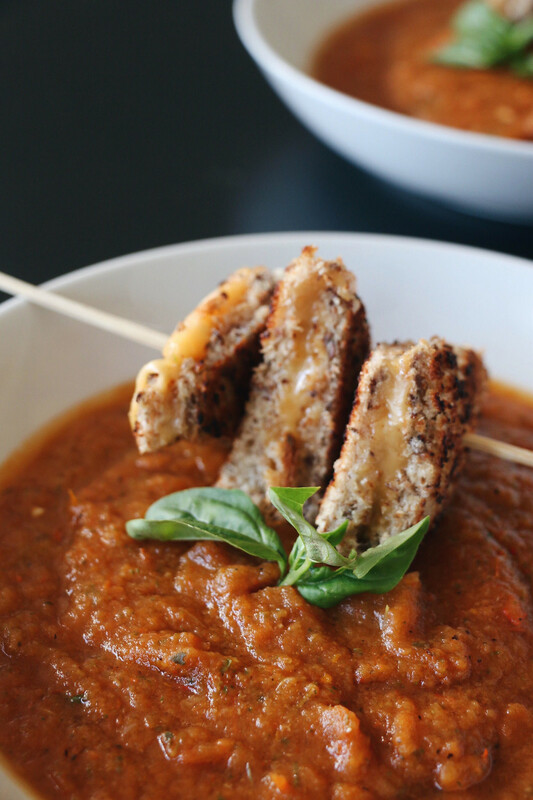 This classic comfort combination has always been delicious, but personally I like my grilled cheese crispy right before I dip it & bite, rather than getting soggy laying in the soup. So I decided to come up with a creative way to reinvent the plating technique. 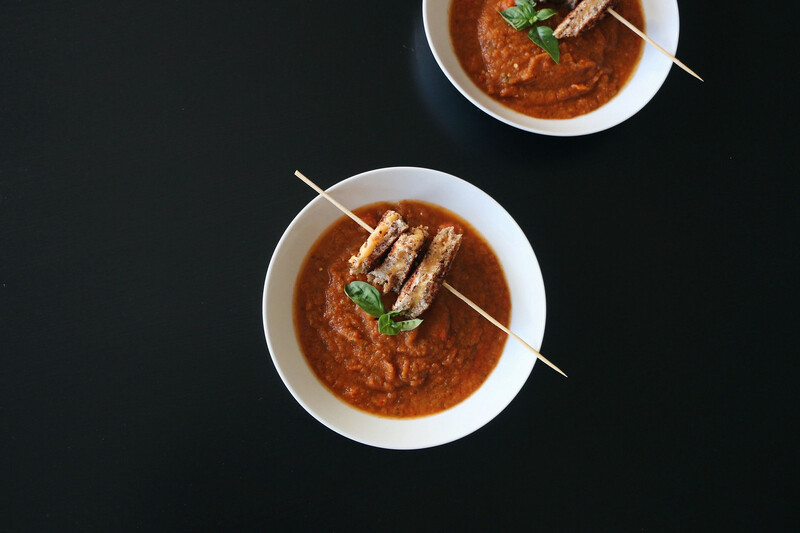 A long skewer was perfect, no need to get your hands dirty, bite size crispy sandwich pieces over homemade chunky tomato-basil soup. Slice onion, carrot, tomatoes, & garlic into large pieces. No need to peel carrot. Saute onions, carrots, & garlic with olive oil. Toss in tomatoes, stir for 30 seconds, & pour in chicken broth. Then add canned tomatoes. Bring to a boil, turn off heat, & let pot cool. Pour contents into blender, top with basil leaves & blend until smooth. Pour back into pot, add beef bouillon cube & dried rosemary. Simmer & stir to keep warm. In the meantime, spread butter over one side of each slice of bread. Grill in pan, put aged cheddar cheese in between slices & sprinkle with sea salt. Cut diagonally in an X formation to make triangles. Pour soup into bowl, top with sea salt & freshly ground black pepper. 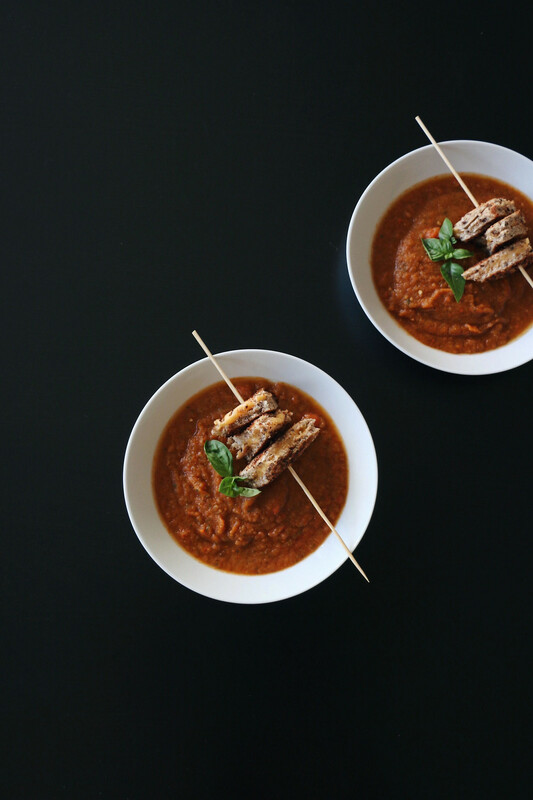 Skewer grilled cheese triangles & lay over bowl. Garnish with basil.